With everything becoming more and more trendy nowadays, it's no surprise that many of us Brits have dashed traditions for Easter, Halloween and now even Christmas. If buying a fake tree didn't upset the older generation of your family enough, you better prepare them for the realisation that one Christmas, you may not have a tree at all - fake or real! With more Britain's working now than ever, it's no surprise that so much Christmas shopping is done online, and as for Christmas Day dinner, so many of us are tired from the lead up to Christmas that hundreds of us will be eating out this year. Let's face it because we all know it, Christmas, no matter how magical and exciting it may be, is still a stressful and very expensive period. Here below are my five steps on how to do Christmas, without the stress! No time to hit the shops this Christmas? Or maybe no patience to face the car park queues or the smelliest public buses? Then that's no problem, ditching the high street isn't that bad of an idea. The selection of products available online is endless, plus there's the opportunity of finding money saving deals and no queuing in shops that have forgotten summer is well and truly over, it's time to turn that air conditioning off! 2: Buy a 'tree' SHELF! No time or too tired to go out and buy a tree, to then get home and have to decorate it? Then why not buy a tree shelf? You could even leave the shelf up way after Christmas has passed if you desire! During the festive period, add a festive snow globe, candle and character, and for the other 11 months of the year add whatever you desire! 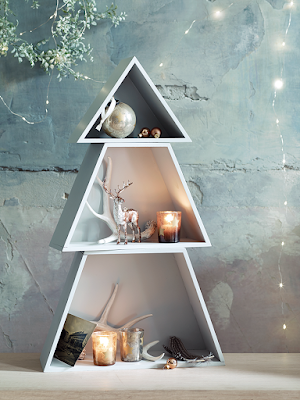 I personally love this tree shaped shelf from Cox and Cox priced at £45, I can imagine my pretty candles resting their with pine cones during the festive period and maybe even some mistletoe, but saying goodbye to Christmas means I can place a special photo and my favourite candle there instead! 3: Don't Cook Christmas Dinner! You've cooked for the last however many years, don't you think it's time you give yourself and the oven a break? Take the stress out of the big day by booking in at a local restaurant, don't worry about defrosting the turkey or how much washing up you've got to do! Local restaurants around me are taking deposits now, so get looking now if you want a stress free crimbo! 4: Select the Gift Wrap Option. Many high street shops and online retailers give you the option of gift wrapping the product you're buying, saving you the much needed time. I'm one of those sad in their 20s females who loves wrapping presents! I do try to make them all pretty with bows and pretty tags, but I admit it takes a good 30 minutes per present, who has that kind of time in 2015!? 5: Start Saving Now For Christmas 2016! Yep, you read that right, it doesn't matter that we've not even sat down to eat our Christmas pudding for this year just yet, just make sure you start saving for Christmas 2016 because sure enough prices are going to get more expensive as they do every year! That's including the local bus and train fares too if you're like me and still don't own even the pinky part of your driver's license! There we have it, my quirky, but totally honest way of having a stress free Christmas! I'm not going to take out my own advice though, I come from a Christmas loving family that put the tradition in traditional!